Hello, Bloggers! 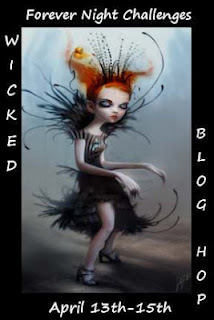 It's FRIDAY THE 13th, and Forever Night Challenges has a wicked blog hop going on today! You should have just come from Kelli's blog. If you're just joining us and want to start at the beginning, be sure to start at the Forever Night Challenges site. We have some awesome sponsors for this blog hop, so you will want to check out all of that info at our site. Then, hop along and visit each of the DT members' blogs. Post your own wicked creation at the Forever Night Challenges site for a chance to win! I often save pretty boxes to use later as mailing packages or gift boxes. 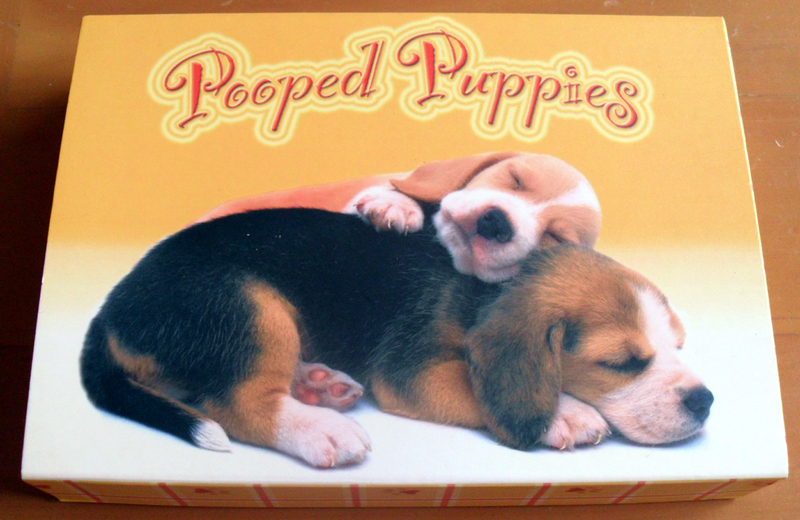 It doesn't matter what the design is on the box because I know I can cover it up somehow. Since it's Friday the 13th, I decided to use some creepy paper I had in my stash. Now, I'm not one to be superstitious when it comes to Friday the 13th, but I do know that some people feel very nervous on this day. Some people take extra precautions in the hopes that they will avoid any form of bad luck. Somehow, I thought the wicked-looking eyes on this pp would be perfect for this project. The word BEWARE came to mind, so I used MTC to weld these letters and create a shadow. The font I used was Blackwood Castle. I then added a bunch of googly eyes to the letters. I also cut out a black cat that was a free svg file from this blog. Here is a close-up of the cat to show the shimmery detail I added with a Sakura pen. 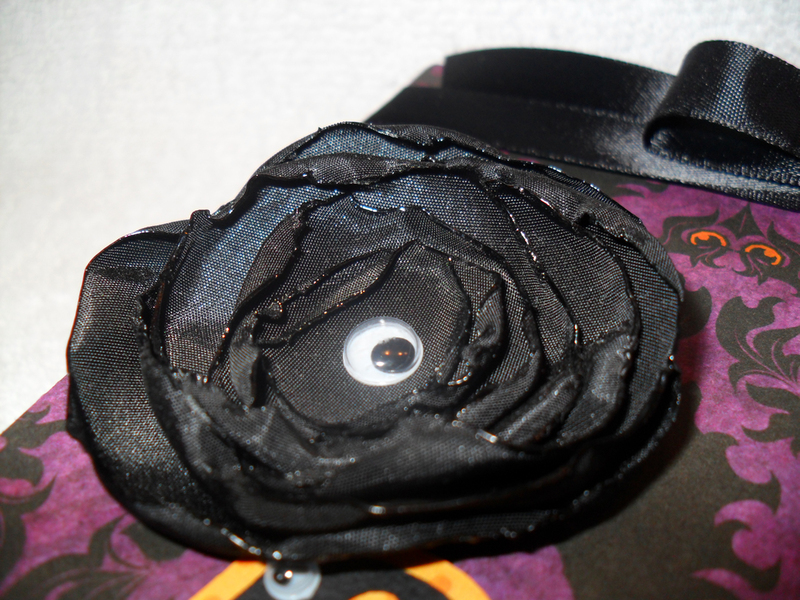 I also added a googly eye to the middle of this black rose which I made myself out of satin. I also added a black satin bow to the box just as an added touch and also to act as a sort of lock for the box. I'm giving this to my teenager so she can put some trinkets inside. Thanks for stopping by! 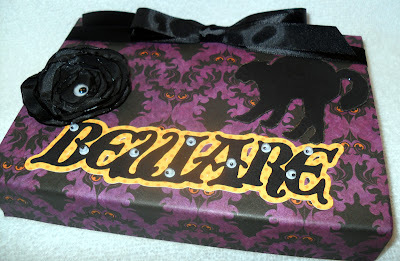 Be sure to hop on over to Jane's blog next to check out her wicked creation! From cute to creepy... love it! Love, love, love how you used a wiggle eye for the center of your lovely black rose. The box is delicious. You did a grand job. Really great box! Love the extra eye in the flower!!! Love it! I especially love all the eyes everywhere! I love your satin rose! and that you turned something so sweet into something so dark and awesome! great job!!! Turning cute puppies into a black cat seems to me like the perfect project for Friday 13th. All the purple and black - this is so so cool! I am loving the flower with the eye in the center. Fabulous project. How cruel covering up all those cute puppies and with a cat, no less!! Great project. I caught the humor of the pooped puppies and the freaked out cat on the finished project...teehee! Wonderful creation!